A Conference on Buddhist Leadership–this Summer. 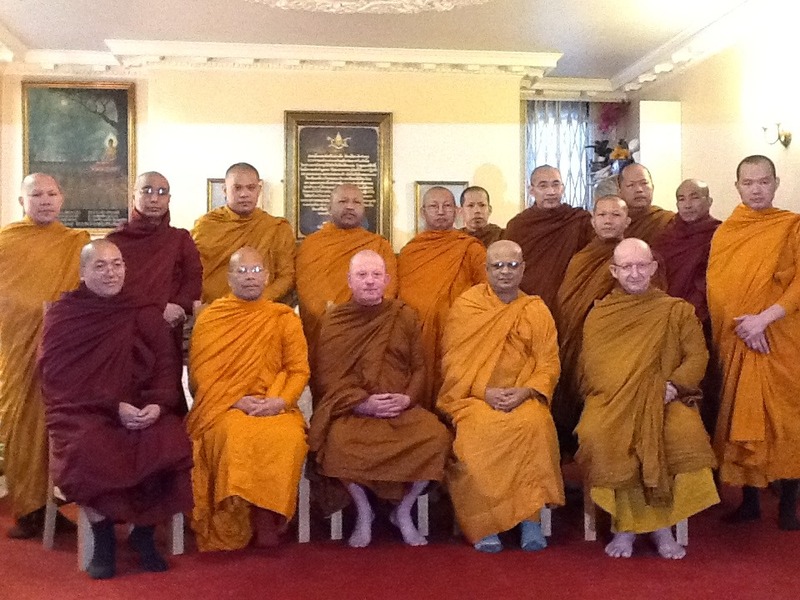 The Theravada Buddhist Sangha in the United Kingdom (TBSUK) is organising a conference to brainstorm and exchange ideas and experience on Buddhist leadership. The issue of Buddhist leadership, especially among the Sangha in the UK, is a most relevant one as effective and appropriate leadership is often called for in many ways not experienced or thought of before. The Sangha has come a long way since its conception some 2600 years ago; as has been the case all along, it is only through discussion and consultation that the Sangha can effectively deal with issues such as authority and adaptation, opportunities and challenges, individual responsibility and community participation. The conference will take place at Wat Santiwongsaram, 107 Handsworth Wood Road, Birmingham. B20 2PH, on 22nd June 2019 and all Theravada Sangha members in the UK are invited. The pre-eminent translator of the Pali Tipitaka into English of our time, the Most Venerable Bhikkhu Bodhi, will be the keynote speaker. There will be also workshops open only to members of the Sangha. If you wish to attend the TBSUK Conference, or just wish to find out more information, please write to tbsuk@foresthermitage.org.uk or telephone 01926 624385. TBSUK Meetings, twice a year, every year. Although not recorded here, TBSUK has been meeting regularly twice every year and at different temples. Our most recent meeting was a meeting of the committee to discuss the forthcoming conference, which at that time we thought of holding at Birmingham University and that is where we met on February 8th. 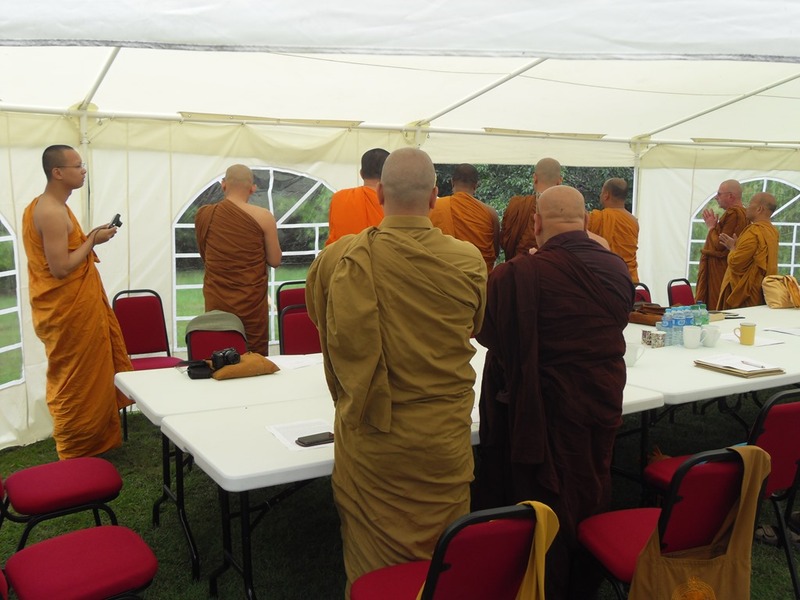 Previously in August we met at the Oxford Buddhist Vihara. TBSUK Meetings in 2014 at Wat Buddhapadipa and at Wat Santiwongsaram. 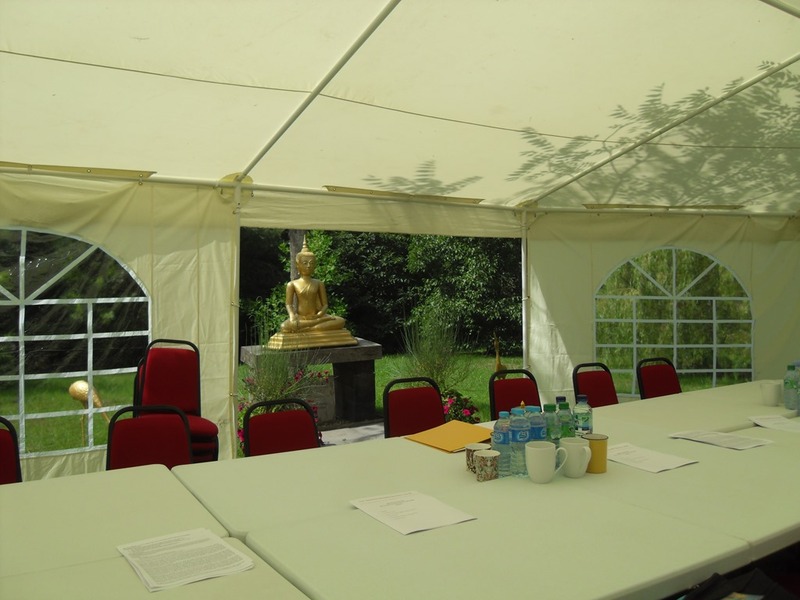 Every year there are supposed to be two general meetings of the Theravada Buddhist Sangha in the UK (TBSUK). One should be in March and the second in August. We try to meet in a different temple each time and we hope to see monks and nuns from every temple at these meetings. Our first meeting of 2014 was on March 26th at Wat Buddhapadipa, the Thai temple in Wimbledon. This was a very well attended meeting and it was particularly pleasing to see a group of Burmese monks present, as well as the usual Thai, Sri Lankan and English representation. Once again there was some discussion around the English language requirement for Tier Two visas and the point was strongly made that at the meeting last year that the chairman, Phra Bhavanaviteht (Luang Por Khemadhammo), had had with the the Minister it had been made clear that there could be no reduction in the level of English required. 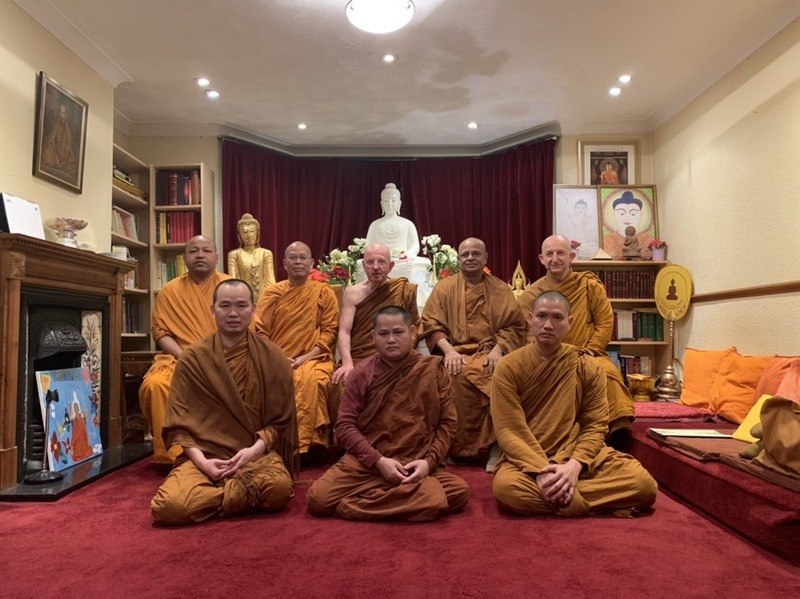 The meeting went on to talk about how to take forward the proposal that TBSUK should develop as a professional body that Theravada monks and nuns would belong to and be accredited by. It was decided to press ahead with registering as many as possible and Phra Maha Bhatsakorn offered to design and produce a form that could be sent around. Although we have a very basic constitution it was felt that an informative presentation of the history and purpose of TBSUK should be produced and Ven. Dhammasami undertook to do that with some support from Ajahn Amaro. There was an amusing discussion about the misinformation on the BBC website about Buddhism, which Phra Bhavanaviteht said he would try and do something about. And another example was given of the continued disrespect shown to the image of the Buddha. This was the well intended but unfortunate My First Buddha – a soft toy version of the Buddha Rupa for children to cuddle. 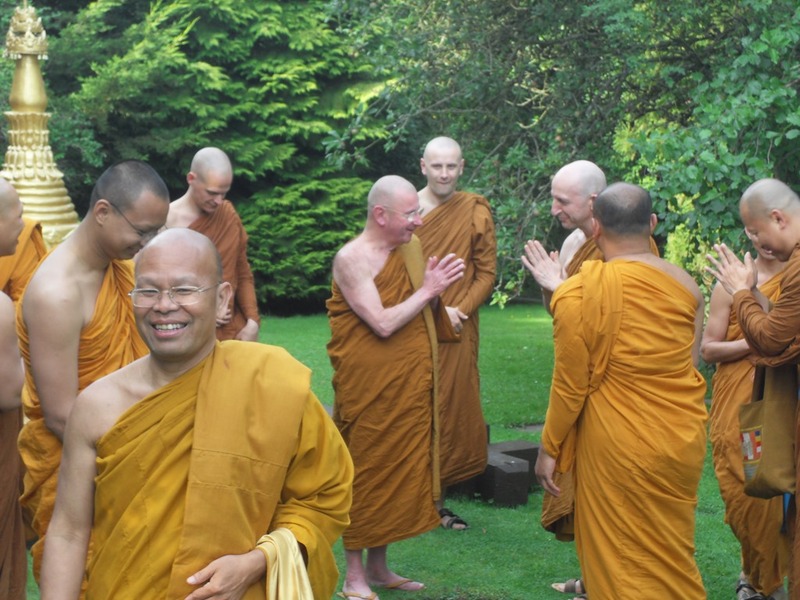 And Ajahn Amaro mentioned that in the latest version the Oxford Dictionary has misspelt the word ‘bhikkhu’. Ven. Dhammasami offered to take that up with them. Lastly, the meeting was informed of an idea for a chanting tour for peace in Thailand to take place around September. 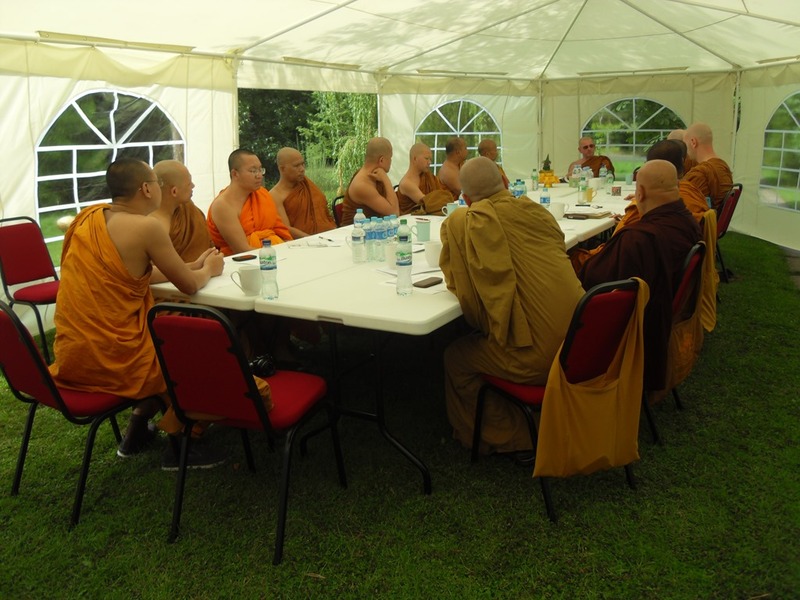 The second meeting was on August 6th at Wat Santiwongsaram in Birmingham. This, unfortunately was not as well attended with no Burmese or Sri Lankan monks present. At the August meeting it is expected that one third of the committee stand down and be either re-elected or replaced. So, Chao Khun Bhavanaviteht (LP Khemadhammo), Chao Khun Phrapanybuddhiwiteht (Ajahn Laow) and Ajahn Aod, all stood down and were duly re-elected to the committee with Chao Khun Bhavanaviteht continuing as the Chairman. It was reported that the Immigration Tier Two Sponsor Guidance has been updated to include the important point that monks and nuns are exempt from the Resident Labour Market Test. It can be found in the Guidance under section 31. Minister of Religion. Note, the reason for the exemption must be given in the relevant box, see paragraph 31.12. Chao Khun Bhavanavieht said that with Lord Avebury’s help he’d managed to do something about the information on the BBC website but it had been hard work, especially as they kept redrafting what he gave them, which meant then having to correct their grammar. Phra Maha Bhatsakorn showed a draft of the form he had created, which the meeting was very pleased with. Only a few minor tweaks were necessary to make it just what is needed. Chao Khun Phrapanybuddhiwiteht (Ajahn Laow) informed the meeting that the chanting for peace in Thailand mentioned at the last meeting, would be going ahead on September 27th at Wat Phra Keow in Bangkok. The final discussion focussed on the poor attendance. It was said that some members have difficulty following the meeting and felt excluded. There was also a suggestion that TBSUK was Thai dominated. It was agreed that there could be a language barrier, especially with the more technical details of some discussions. And of course it’s difficult to get over the feeling of Thai dominance when others don’t attend. It was resolved to make an effort to overcome both criticisms. The next meeting will be at the Oxford Vihara on March 11th, 2015, at 3pm. This afternoon a meeting of the committee of TBSUK was held at The Forest Hermitage. 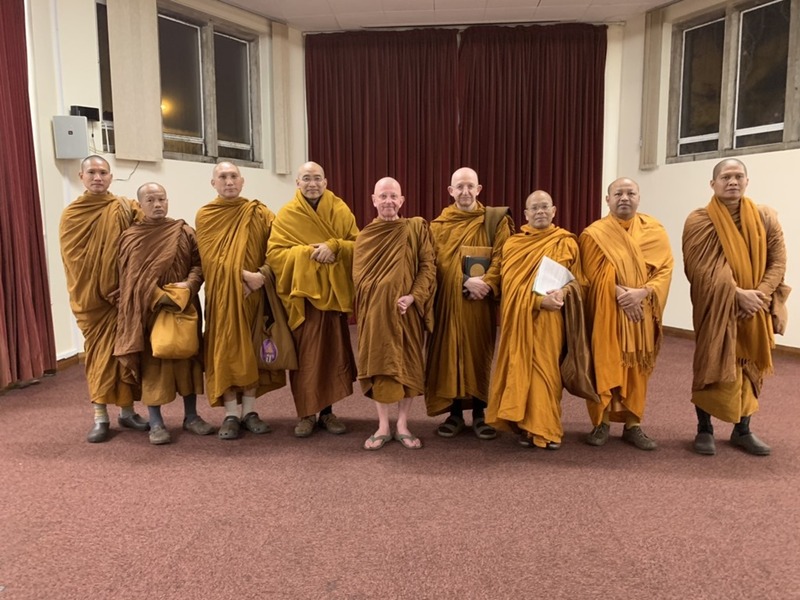 The purpose of the meeting was to take forward the proposal, agreed at our last General Meeting in August, to develop TBSUK as a professional registration body for Theravada Sangha members in the UK. This was a well attended meeting with almost a full complement of committee members present. Only Venerable Seelawimala of the London Buddhist Vihara was unable to be with us. For the benefit of Ashin Pannobaso who was not at the last couple of meetings and to remind other members, I briefly related the circumstances that had led us to consider the advantages of having all Theravada monks and nuns in this country properly and professionally registered with a responsible and known association or body, just as is the case with practically all other professions. I explained that this is not to be disrespectful of our various origins in Thailand, Sri Lanka and Burma, or wherever, but to develop for the UK a body not unlike what we have in those various Buddhist countries that registers, regulates and to some extent governs, represents and protects the Sangha. Furthermore nearly all our monasteries and temples in this country are small and it’s obvious, especially with some of the problems we have in common, that what each of us on our own can achieve is relatively limited but when we come together so much more can be done. A recent example has been the Immigration problem and I’m sure it made a difference when I was able to say at a meeting with the Immigration Minister that I was representing fifty temples. Registration will be voluntary and will take time and so I believe we should get on with it as soon as possible. I’m pleased to say that we had a very useful discussion and now the work begins. When our main business had concluded, Ven. 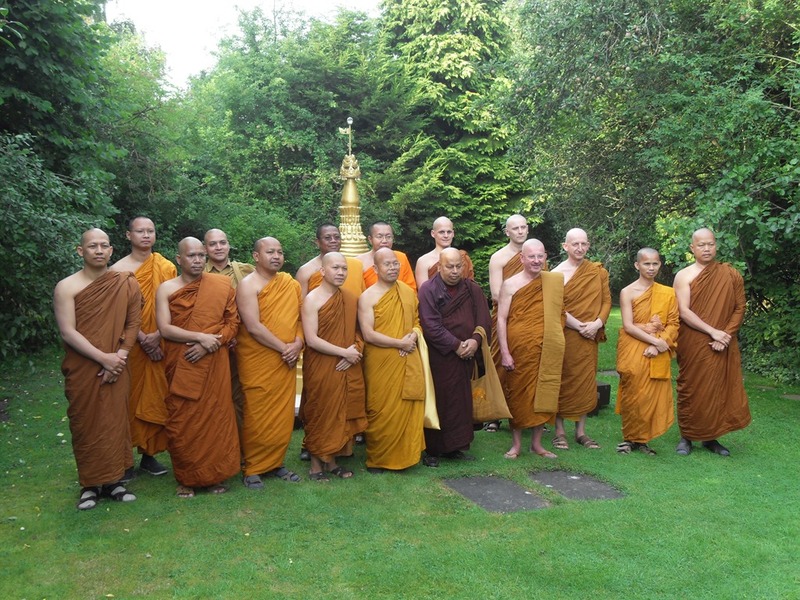 Chao Khun Phrapanyabuddhiwithet (Ajahn Laow) raised two matters that he had brought from a recent meeting of Thai monks in Europe. The first concerned a so called work of art in Munich that features a large Buddha-Rupa on its side. This has caused a lot of offence and there’s been quite a bit about it I believe in the Thai press. But the protests have all been ignored. And the second was the refusal of Belgium to recognise Buddhism as a religion and in consequence of this there have been some difficulties put in the way of monks going to there. I don’t think there’s much we can do about the first matter but regarding the second I said I would make some enquiries about what EU law has to say about it. All in all it was an excellent afternoon and I’m so grateful to everyone for going to the trouble of coming here. 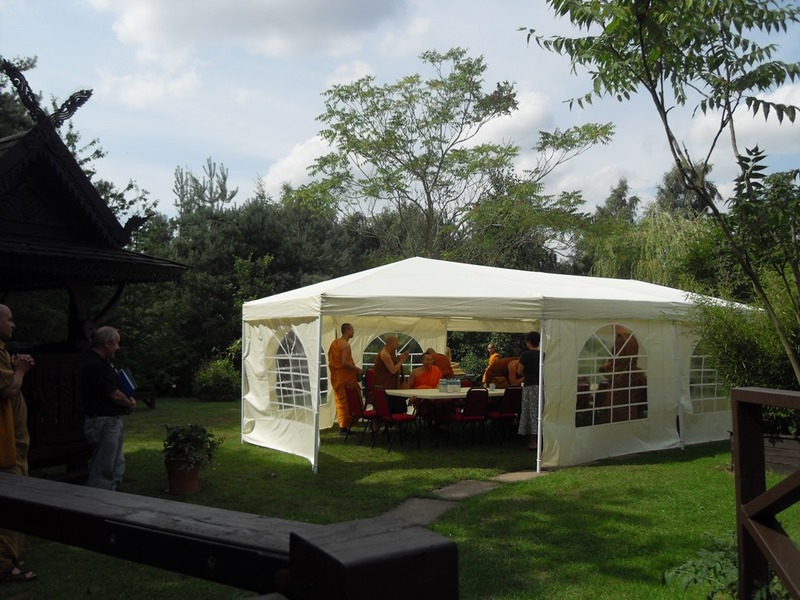 At 3pm on August 7th at Wat Pah Santidham, The Forest Hermitage, we held the latest biannual General Meeting of the Theravada Buddhist Sangha in the UK (TBSUK) under my chairmanship. 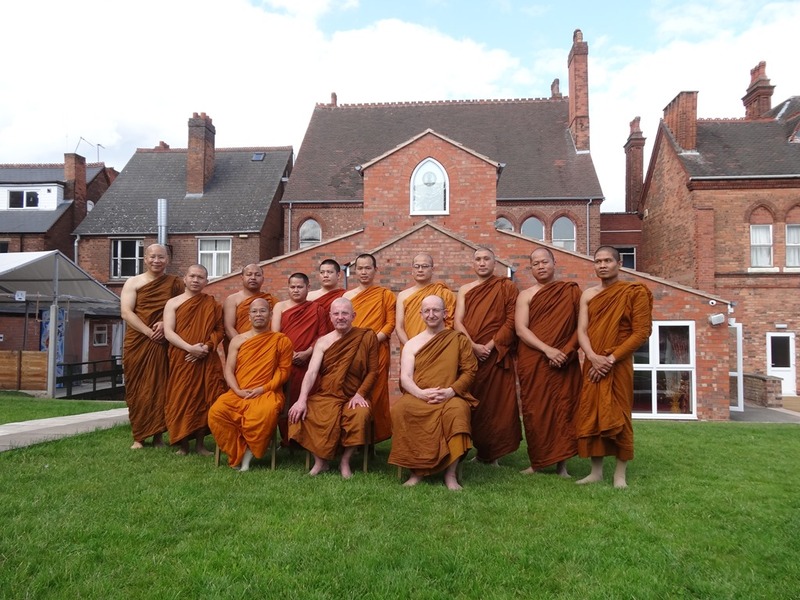 Present were sixteen monks representing Wat Mahathat UK, Wat Santiwongsaram in Birmingham, Wat Sanghapadipa in Wales, Amaravati, Wat Phra Singh UK in Cheshire, Sri Saddhatissa Temple in Kingsbury, Wat Sri Ratanaram in Manchester and of course Wat Pah Santidham, the Forest Hermitage. I had emailed notice of the meeting to all the temples for which I have email addresses and posted notices to those I haven’t, in all fifty Theravada temples. I have had one posted letter returned, addressee gone away or address incomplete, from Wat Santiranaram in Kent. And one email to Saraniya Meditation Centre in Manchester bounced. I had had one apology from Venerable Bodhidhamma and another from Sister Candasiri in Scotland. Concern was expressed that again we had no Burmese monks present and only one Sri Lankan temple represented. There was a short discussion about how we might remedy this in future and widen and improve the representation of the Burmese and Sri Lankan Temples. Every year at our August meeting it is necessary for one third of the membership of our Committee to stand down and either stand again for re-election or be replaced. This year it was the turn of the Burmese monk, Ashin Pannobaso, and the committee’s Thai secretary, Phra Bhatsakorn Piyobhaso, and both were unanimously re-elected. Next on the Agenda was the ever present Immigration problem and I took questions and commented on the report that I had already circulated of a meeting I had with Mark Harper, the Immigration Minister, in March. The main points from that were that there can be no change to the English language requirement for Tier Two and no movement from Tier Five to Tier Two. Tier Five must remain by its nature temporary. It was confirmed that there is no requirement for the resident labour market test to be met when applying for a visa under Tier Two and no need to report authorised absences or to keep copies of passports for unsponsored residents. And it is possible for Buddhist monks and nuns here under Tier Two (Minister of Religion) to claim settlement and they will be exempt from the £35,000 threshold which will apply to workers in other Tier Two categories from 2016. Then we talked briefly about the conviction and imprisonment of the Head of the Thames Vihara for sexually molesting a young girl. He has appealed and the appeal has not succeeded. The extreme seriousness of such matters both within the framework of the law and of the Vinaya was emphasised and no matter how shameful if might be temples should not even think of trying to cover up behaviour of this kind. It cannot and must not be tolerated. The problem of the lay supporters not knowing and not understanding monastic rules was also spoken about. This led onto a discussion on the upgrading of TBSUK to become an authorising professional body. In Buddhist countries the Sangha has some sort of governing body but here we have nothing of the kind and I said that I felt that it was time for the Sangha here to grow up and begin to take care of itself rather than be endlessly referring back to Thailand, Burma and Sri Lanka. I went on to quote the late Venerable Saddhatissa who when we came to England in 1977 Luang Por Chah told Ajahn Sumedho and myself to respect as we would the Sangha Raja. Venerable Saddhatissa once made the point to me that it is incorrect to refer to the Thai Sangha and the English Sangha and so on, properly there is just the Sangha and within that we should drop all worldly conventions of class, caste, rank and nationality. I have just registered with the UK Board of Healthcare Chaplaincy which is seeking to promote and raise the status of chaplaincy in healthcare and I believe it would be advantageous for Buddhist monks and nuns to be similarly registered. I believe it would be a support to Sangha members, it would give a recognised and proven authority as to who and what we are, it would expose fake monks and fraudulent activity, it would help us to maintain and even improver standards, it would enable us to deal effectively with bad behaviour and it would help justify the faith and confidence that our lay followers expect to have in us. I do not see this as another religious power block but as a simple and effective way of ensuring the growth and stability of the Sangha in this country far into the future. Obviously to begin with it will have to be voluntary and I recognise that it will take time to develop and I believe the sooner we get on with it the better. So then we decided that the Committee should take this further and for that reason meet here on October 16th at 3pm. Next concerns were raised about the recent reports in the media of the Buddhist attacks on the Muslims in Burma and the video of a certain Thai monk living it up on a private jet that had gone viral on the Internet. My answer was that these are more good reasons for upgrading TBSUK. If we were properly established and well known we would be able to answer our critics and publish statements that would make the position of the Sangha clear. When things like these happen the media would learn to come to us and we wouldn’t have to remain silent and put up with all this damaging publicity. Our next General Meeting was then set for March 5th next year at 3pm at Wat Buddhapadipa in Wimbledon. Our amicable and productive afternoon then wound up with the Asking Forgiveness ceremonies and the all important photo calls. Report of a meeting with the Immigration Minister. This is to inform you of the results of a meeting with Mark Harper, Minister for Immigration, on March 26th. This was arranged by Lord Avebury who accompanied me, together with the Thai nun from The Forest Hermitage. It was an extremely useful meeting and I put to the Minister our concerns about the English language requirement in Tier Two, the complication of the local labour market test or supernumary status for monks and nuns applying to come here and the confusion over their employment status, and I complained about the rigorous inspections experienced, particularly by Amaravati. We also asked about eventual settlement rights of monks and nuns who might have been here under Tier Two, expressing our concerns about continuity etc. We were listened to carefully and courteously and I am pleased to say that at the end of the meeting Mark Harper also felt the meeting had been a useful one and passed the comment that he had learnt from it. His immediate comments on the day were: that it was unlikely that anything could be done about relaxing the English language requirement, that Tier 5 without an English language requirement offers an alternative route and opportunity to improve a monk or nun’s English, we then asked if a monk or nun here on Tier 5, once they had passed the English language exam could be allowed to switch from Tier 5 to Tier 2 without having to return to their country of origin and he said he would consider that; he said they would look at removing the resident labour market test requirement and clarifying the role of monks and nuns as not employed, and he said they would look again at the supernumary term; he agreed that the inspections complained of had been over the top and said he would instruct his officials to look into that; and he stated that having spent 5 years here under Tier 2 monks and nuns are eligible to apply for settlement. Afterwards Sister and I called at the Thai Embassy where we briefed the Minister, M.R. Adisorndej Sukhasvasti, about the meeting we had just had with the Immigration Minister. Since the meeting there has been further correspondence seeking and receiving clarification and decisions on various points discussed at the meeting. I copy for you below relevant extracts from one letter for your information and use. I can confirm that there will be no test of earnings when those using Tier 2 (Minister of Religion) category apply for settlement in the UK. They will be exempt from the £35,000 threshold which will apply to workers in other Tier 2 categories from 2016. I can confirm that it is not a requirement for temples to keep copies of passports for unsponsored residents, nor to report authorised absences from the monastery grounds. (b) That the role involves living mainly within and being a member of a religious order, which must be a lineage of communities or of people who live in some way set apart from society in accordance with their specific religious devotion, for example an order of nuns or monks. So you don’t have to advertise but we have been advised that the requirement to include an explanation will remain. To avoid further refusals, Sponsors of monks or nuns should ensure they complete the Certificates of Sponsorship correctly.They should tick the box to indicate that the Resident Labour Market Test (RLMT) has been complied with. In the free text box which follows, they should explain that the role is deemed to have met the RLMT as it will be carried out by a member of a religious order living in a segregated religious community. Please do not forget this. I have also been given a contact person with whom I can liaise and who will help me produce a simple guide to applying for a visa for monks and nuns. I’d better make clear that we did raise the matter of the English language requirement at the meeting and we did ask for a reduction in the standard required or the chance for monks and nuns who might have been here under Tier 5, when they could have been improving their English, to transfer to Tier 2 without having to go back to their country of origin. He was reluctant but agreed to think about it. He has since said that it would be inappropriate to allow switching from Tier 5 to Tier 2. So no progress on the English language requirement I’m afraid.